This past summer saw a surge in professional learning opportunities for Round Rock ISD staff related to holistic wellness, emotional well-being, mindfulness, and other workshops helping us become the best versions of ourselves. 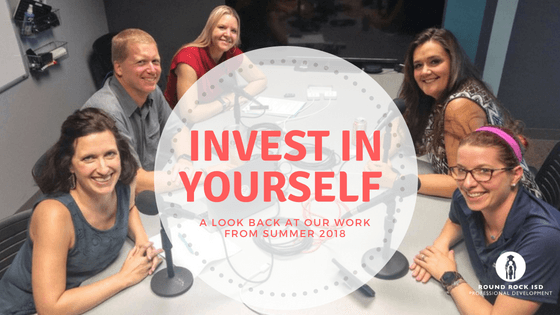 This week on the podcast we are joined by the Director of Professional Development, Edie Binns, who organized the summer of learning. As well as the facilitators of the majority of those sessions Rachelle Finck, Dr. Amy Grosso, Kristina Snow, and Ryan Smith. Social Media and Students: What educators need to know – presentation based on the book Social Media Wellness: Helping Tweens and Teens Thrive in an Unbalanced Digital World. I have presented for ITS, teachers, and the CTAT conference in Ft Worth. Mental Health and Students: What I need to know and what I should do – presented to CTE teachers. The rates of mental health issues in adolescents continues to rise with currently one in three suffering from an anxiety disorder. It is important to understand what culture in and outside of the classroom can be positive for students struggling with their mental health. Holistic Wellness: Finding balance in an unbalanced world – presented to CTE teachers and RTI staff. While our job focuses on students the majority of the time, if we don’t take care of ourselves, we are not able to able to function at our highest capacity. By focusing on creating good boundaries we will be able to live a balanced life. When does Stress become Anxiety? – Presented at GT parent conference. There is a difference between stress and anxiety and by knowing the difference, we are better able to help students who are struggling. Stress, Anxiety, and Mindfulness – Presented to CTE teachers. Stress and anxiety are high among students today. Mindfulness is one way of helping students cope. Talks Saves Lives: An introduction to suicide prevention – presentation developed by the American Foundation for Suicide Prevention. I presented for administrators and teachers this summer. On Friday, I will be training all bus drivers. Request a Workshop for Team Here!